Americans use 500 million drinking straws every single day. 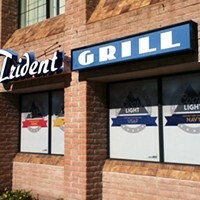 Many Tucson businesses are joining the cause to do away with the plastic perils, as you've surely heard. One local hotspot is going a step further— Hotel Congress is now serving reusable glass straws. "Overall, it's been pretty good," said Rita Boutwell, director of training and development for Hotel Congress. "Some people might not get it, but plenty do." 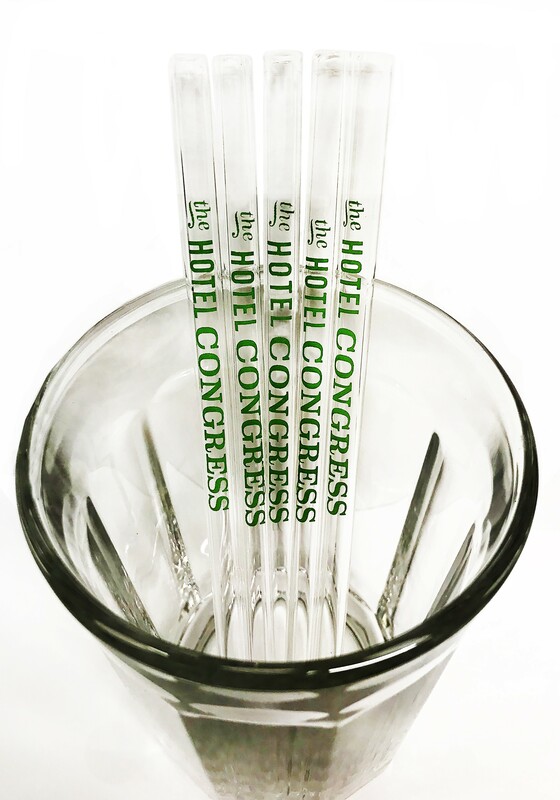 The glass straws can be purchased at the Hotel Congress front desk for $9, and come in a variety of colors and patterns. The reusable straws come from local printing company Hendrixson Glass Decals, run by Del Hendrixson. Hendrixson, a screen-printer and brander by trade, came to Tucson a decade ago. He found that too many people were already producing shirts in town, so he changed his printing style to glass decals on pipes and other glassware. Earlier this year, Hendrixson was at Hotel Congress and learned of the sustainable measures taking place. "I found out that if you wanted a straw, you had to ask for one," Hendrixson said. "I never really thought about little changes like that before. And I found I could refocus my direction into something that could be fun and beautiful." The reusable straws are made from borosilicate glass, commonly used for laboratory glassware, and are stronger than normal glass. "After Del found out, he came in with some really great borosilicate glass straws and asked if we'd like to use them," Boutwell said. "We thought it was a great idea." The straw designs depict sea animals— a reference to who the straws are aimed to save—as well as text like "Tucson Cares" and "Hotel Congress." While Hendrixson doesn't blow the glass himself, he purchases it, cuts it to size, and fuses in the ink. "I can't blow glass, but I can design it," Hendrixson said. "And these glass straws make so much sense to me. We're behind them 1,000 percent." For Hendrixson, the reusable glass straws go beyond a simple business interest. His wife is from the Amazon, and her and her culture had no idea of the global crisis plastic was causing. So Hendrixson Glass Decals is also sending glass straws to Brazil, in an attempt to spread the knowledge of glass straws as far as possible. Hotel Congress's first order was for 100 straws. They became available in early August, and have already sold several. While distributing thin pieces of glass to an alcohol-infused Friday night crowd might seem a recipe for disaster, Hotel Congress has always distributed these to the masses in the forms of shot and beer glasses. "If you drop glass, there's always a propensity to break," Hendrixson said. "But these are fairly thick, and the one's I've dropped have bounced." Boutwell can attest, saying that she's carried her own glass straw around in her purse and never had any issues. The glass straws are 8mm tubes with 1.5mm thick walls, are microwaveable, dishwasher-safe and can be used in both hot and cold beverages. "We recognize that it is our responsibility to be ethically conscious and sustainably active," Hotel Congress said in a recent release. "For over a decade Hotel Congress has been implementing green initiatives... Our partners include UA Compost Cats, Mrs. Green's World, Ecoblue, Clean the World, Refresh Glass, One Less Straw." That last partner, One Less Straw, is a pledge campaign that "strives to educate the public about the dangers of single use plastic straws, its effects on our health, our environment, and our oceans". Hotel Congress joined the pledge campaign in early 2016, which, according to its website, resulted in 10,000 fewer straws being used every week. Hotel Congress still offers regular straws, but only upon request, and the current single-use straws are made from recyclable plastic. "It's the greenest option we have for plastic straws," Boutwell said. As for future sustainability goals, Hotel Congress is planning many, although most of them are on the restaurant side, not the plastic-use side. The next big plan, according to Boutwell, is to begin using 100 percent local honey. "Tiny things making tiny differences," Hendrixson said. "But a difference is a difference."